One of three very large tiankengs of the world is Dashiwei tiankeng (two other are Xiaozhai tiankeng and Haolong tiankeng). 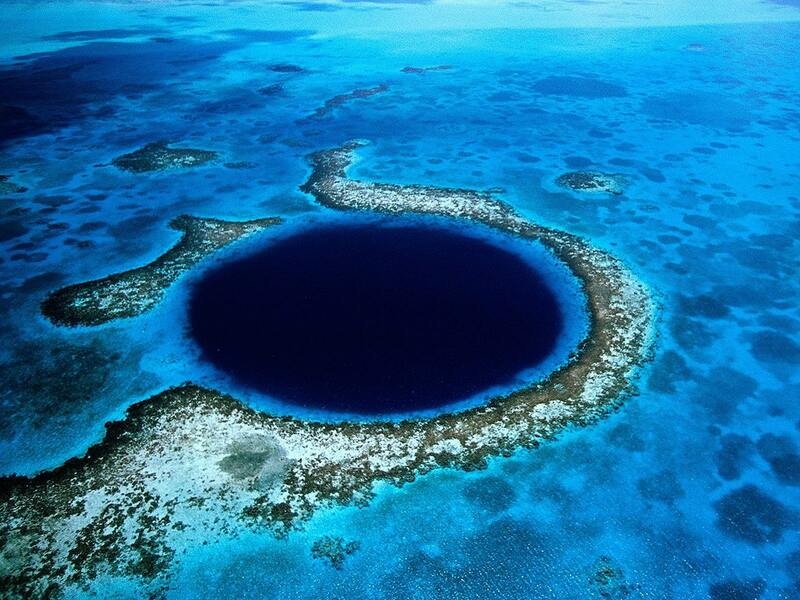 Now it seems unbelievable that this 613 m deep sinkhole was discovered by scientific community only in 1998. Sinkholes (also – dolines) are larger natural depressions in the surface of Earth created by karst processes (natural process of solution of carbonate rock) and suffosion – natural process of removing the particles of sandstone and similar rocks until there are created voids. Largest sinkholes of the world recently have gained special term – tiankeng. This is rather poetic Chinese term, which can be translated like "heavenly pit". 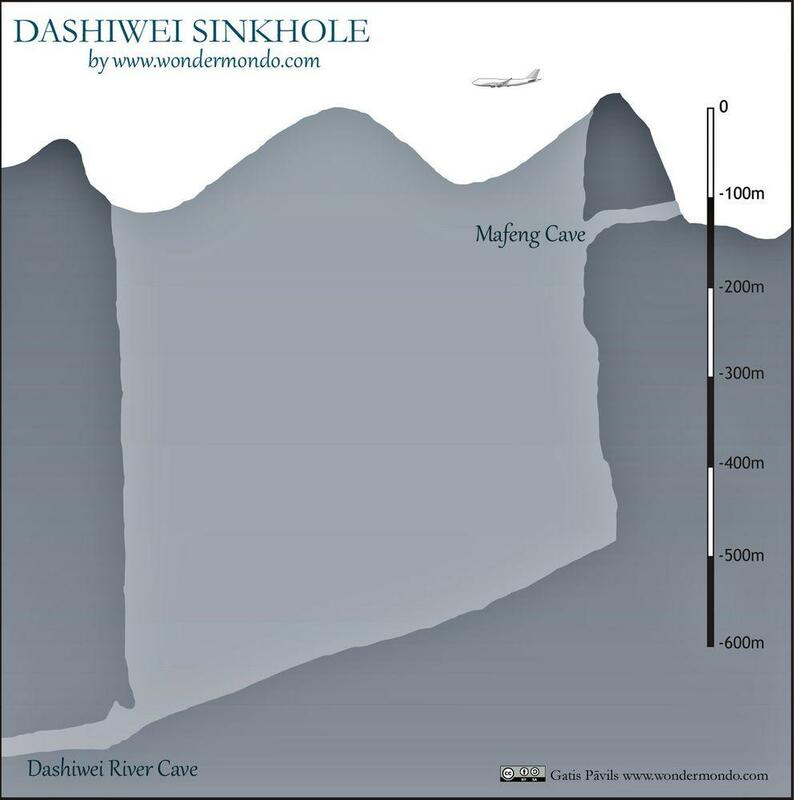 True tiankengs have vertical, at least 100 m high walls, their diameter is at least 100 m. Bottom of true tiankengs is comparatively flat and for most part is crossed by an underground river seen in daylight only at the bottom of tiankeng. There are not too many tiankengs in the world – some 75. Most of them – approximately 50 – are located in southern and central China. Some tiankengs are located also in Papua New Guinea (f.e. Minyé sinkhole), Mexico (f.e. Sótano de las Golondrinas), Croatia and some other countries. Most sinkholes have formed in carbonate rock, but few also in sandstone (Sima Humboldt in Venezuela). For the formation of tiankengs there is needed extremely thick (several hundred metres) and clean carbonate rock and abundant rain. Location should be well above the sea level. In such conditions several hundred metres below the surface form powerful underground rivers. These rivers gradually wash out the rock, creating enormous underground voids. The ceiling of these hollows at some moment collapses and there forms giant hole in the ground – tiankeng. In carbonate rock the life of tiankengs is not too long – after some while the vertical walls erode and there forms giant bowl-spahed depression. By far the largest and most impressive tiankeng in the world is Xiaozhai tiankeng, but Dashiwei tiankeng is the only other tiankeng of comparable size in the world. The third largest tiankeng in the world is Haolong tiankeng, also in China. In 2001 there was discovered unbelievable geological feature in Guangxi, west from Leye city: large group of tiankengs located rather close together. Over the years here have been found 28 tiankengs. Imagine: out of some 75 tiankengs of the world 28 are located here! Largest of these sinkholes is Dashiwei tiankeng. This incredible formation is 600 m long and 420 m wide, perimeter is 1580 m. Depth of tiankeng is 511 – 613 m – like two Eiffel towers placed one on another. Area of the opening is 167,000 m², volume – 75 million m³. Leye karst area with all its tiankengs has formed in Carboniferous and Permian limestones, with thinner layer of Triassic clastic rocks above. Picturesque, hilly landscape is located 1,300 – 1,500 m above the sea level. Below this limestone layer, at the depth of 400 – 800 m there flow several powerful underground rivers, for most part unmapped. Dashiwei tiankeng has formed by one of these rivers – Bailong underground river. This river still is crossing the floor of tiankeng. This underground river has been investigated 6,000 m downstream from Dashiwei tiankeng – it continues as a cave with beautiful speleothems. After these 6 km the powerful stream disappears into deep, practically inaccessible fissures. Dashiwei is one of few tiankengs made accessible to tourists since October 2003. People here descend thousands of steps to get into this mysterious, incredible and small world. One of routes includes outlook from Mafeng Dong cave to this incredible, lush landscape. Bottom of Dashiwei tiankeng is covered with thick layer of debris, which is overgrown with forest, which includes such rare species of trees as Pseudotsuga brevifolia Cheng & Fu 1975 – rare, beautiful conifer, met only in karst landscape of this part of China. This 96,000 m² large patch (like 12 – 13 football fields) of forest is surrounded by incredibly high vertical cliffs. This forest is unique. For many thousands of years here have been preserved plants and animals, which elsewhere have gone extinct. In total here grow more than 1,000 species of plants. Here have been discovered new, unique species of crabs and spiders, here live blindfish, shrimps (in cave river), flying squirrels. China has got it all – more than one billion people, large area, great and very long history, very distinct and at the same time – very diverse cultures, great and varied nature. Category includes outstanding sinkholes – large natural depressions or holes, which for most part represent collapsed caves. A companion volume to the new IMAX film offers a sumptuously illustrated, close-up look at the world’s great cave environments, capturing the wonders and perils of caving and describing the unique characteristics of these underground habitats. This is the first study of the karst areas of China to be carried out by a Western geomorphologist, and almost all the sources are from Chinese works, as yet unpublished in the West. 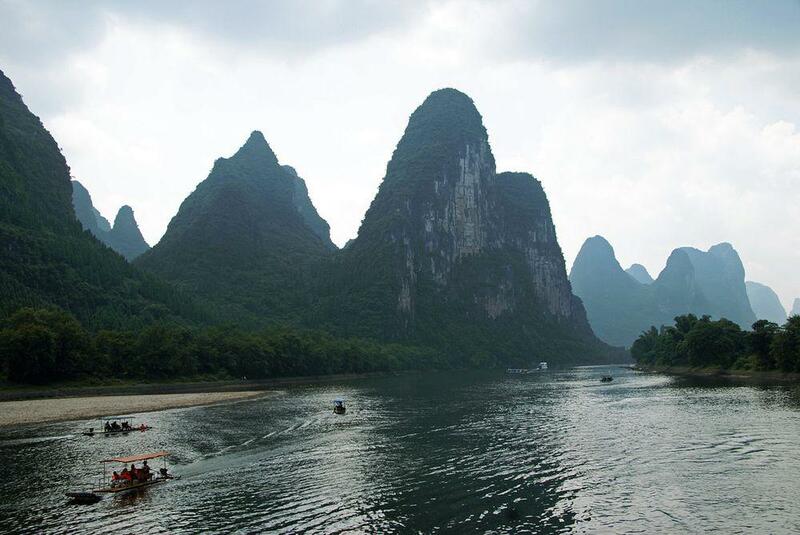 Karst areas are sensitive to environmental influences and Chinese attempts to deal with these are discussed here, as are Chinese methods of studying karst since they differ somewhat from those in the West.